TAIYO YUDEN has released new Bluetooth 5 compatible wireless communication modules for IoT-enabled devices, including wearable devices, healthcare equipment, and logistics terminals, which are required to be smaller and thinner. 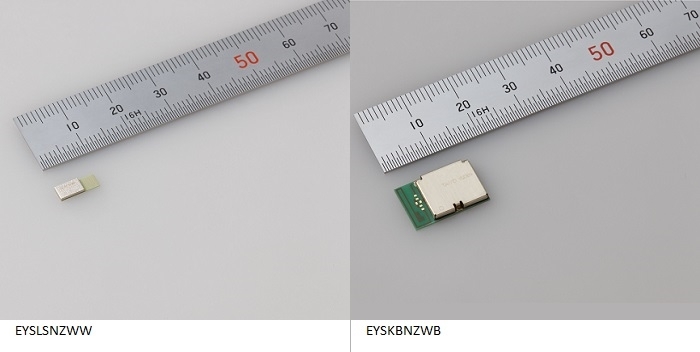 The newly-developed EYSKBNZWB (15.4×10.0×2.0 mm) and EYSLSNZWW (3.25×8.55×1.0 mm) modules can support the long-range capability, which has been a new addition to the Bluetooth 5.0 standard. This capability will improve the connectivity of wireless communication over a long distance or in an environment in which it is hard to receive radio waves, allowing you to extend the effective communication distance. The EYSLSNZWW module utilizes TAIYO YUDEN’s unique shield mold technology, realizing an almost 90% reduction in volume compared to their conventional module. IoT-enabled devices are required to be operable in sensor networks everywhere and to have extremely low power consumption. These devices will be used in a wide variety of applications, sizes, and environments, which in turn requires the embedded wireless modules to be available in a wide range of lineup. Most of those devices use Bluetooth as the low-power consumption wireless communication standard. Building on the low-power consumption of Bluetooth V4.2, the latest version standard, Bluetooth 5.0, is equipped with new capabilities for supporting various needs, such as a two-fold increase in communication speed or up to a four-fold increase in communication range. TAIYO YUDEN has successfully commercialized Bluetooth 5.0 compatible wireless communication modules. The launch of the new communication modules, EYSKBNZWB and EYSLSNZWW will expand the company’s product lineup in size and capability, which allows proposing the most suitable wireless communication modules for the devices being developed. TAIYO YUDEN TECHNO SOLUTIONS (Takasaki City, Gunma Prefecture, Japan) will start volume production of these products in September 2018. A sample of each model will cost 3,000 yen (about $27). 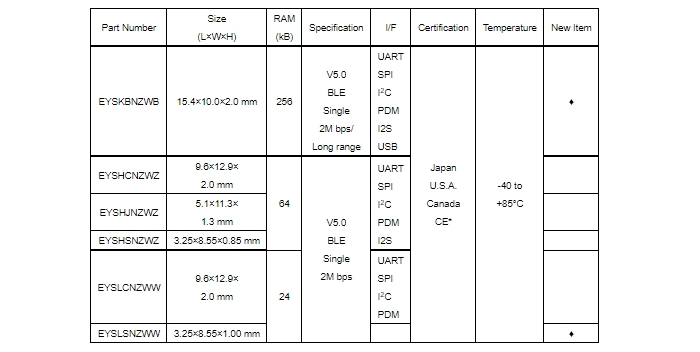 The characteristics of the new Bluetooth 5.0 wireless communication modules are as shown below. Click here to see Bluetooth 5.0 Modules from the leading manufacturers on everything RF.